So when I last spoke to you all, I was going to make a salted butter tart after having had a rather long and tortured night listening to the relationship highs and lows of my neighbour. I have had a three day weekend so I’m somewhat calmer come Monday afternoon than I was when I last blogged. I have had a domestic weekend, starting with my Friday night in with wraps, wine and children in need, to a Saturday run, bread bake and mid afternoon slump then I baked a fabulous tart. It’s called a Salted Butter Tart, but ignore that Americanism, it was in fact a salted caramel tart. The great thing about it is that a 23 inch tart is likely to last me a decade as it is so very rich. I got the recipe from a book called Fat by Jennifer McLagan. Mix the fat into the flour and salt to make fine breadcrumbs. Mix the egg and sugar together with a small whisk. Add these to the flour, salt and butter mixture, to form a smooth dough. If a tad dry, add iced water bit by bit until its a smooth, not sticky and damp, dough. Separate into two disks and chill for 30 mins. You only need half the dough, but it’s good to freeze and use later if you like. 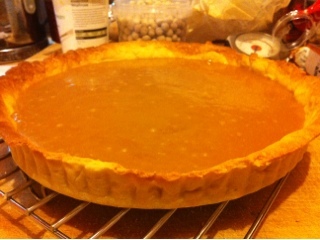 Roll out when chilled, and place a loose bottomed tart tin measuring 23cm in diameter. Blind bake lined inside with parchment and dried beans or baking beans. Bake for 15 mins on 190 degrees c or gas mark 5. Remove the beans and bake again for 10 minutes, but keep your eye on it. You can now turn the oven off. You are done with it. Add the butter and sugar to a pan over a moderate heat and mix with a wooden spoon. It goes weird. It is like a roux. You just keep stirring expecting a bubbling caramel like when you mix sugar and water, but it is not like that. It goes stodgy, thick and floury looking. You just keep stirring. The butter comes out and it looks separated. You will think is this right? Yes, it is. Keep going, put the radio on and don’t panic. Put the cream in a pan and bring it to the boil. Turn that off. Stir the roux-like mixture for over 10 minutes, it will start to cohere and then turn dark caramel. Then turn the heat off when it looks like a thick caramel. Take it off the hot ring and pour in the cream. It will spit and splutter the stop. 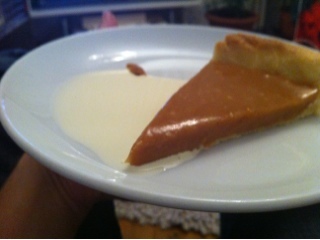 Put the pan back on the heat and stir the mixture, bringing the caramel and cream together. Mix for about 5 minutes to allow it to dissolve into one another and come together as a thickening caramel sauce. I added the sea salt flakes now to add a bit extra salt tang. Turn the heat off and let the caramel cool slightly. After 15 minutes or so, pour into your pastry base and leave to cool completely. It will be a sweet, indulgent, artery clogging treat. Well, why the devil not? It’s a good one. I’m other news, I have made my Christmas puddings. 8 hours steaming? Thank god I took a day off work. I have fashioned a steamer out of a colander. I had to do something! I used Delia’s recipe. If you want tradition, go Delia. If you want razzmatazz, go Ina and Nigella. I’m watching Delia’s Classic Christmas. I do love her. She talks to me, when she says things like “I don’t care about Chef’s as we are home cooks”. I respond, thanks D, love you. Ok, off to check on water in my mock steamers.